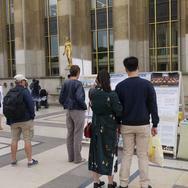 Falun Gong practitioners in Paris held events near the Eiffel Tower on Sunday, September 3, 2017, as they often do on Sundays. Numerous tourists were in the area. The practitioners' exercise music, yellow costumes, and banners were eye-catching. As the practitioners demonstrated the exercises, some passersby said they wanted to learn on the spot. 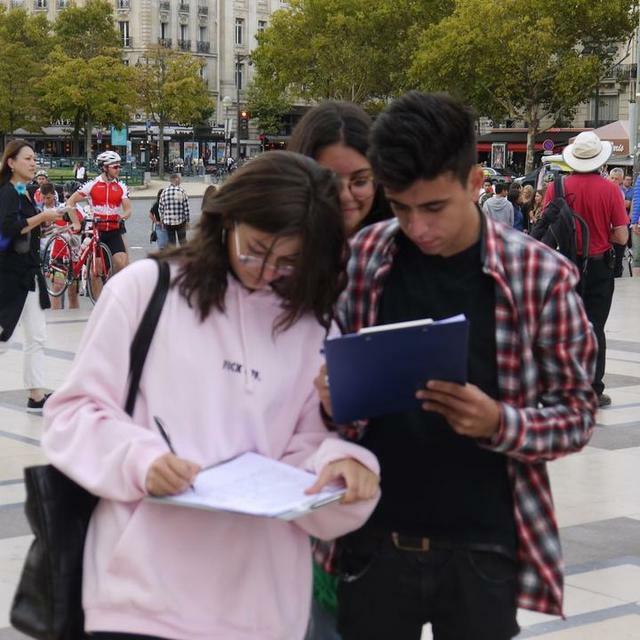 Some asked for flyers and other informational materials. People were shocked upon hearing about the CCP's organ harvesting from living Falun Gong practitioners. 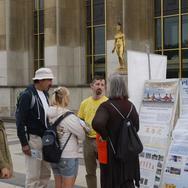 Reymond George, a tutor, said the he had seen Falun Gong practitioner marches before. He was appalled upon seeing the banners exposing the CCP's live organ harvesting. He read the poster carefully with tears in his eyes. 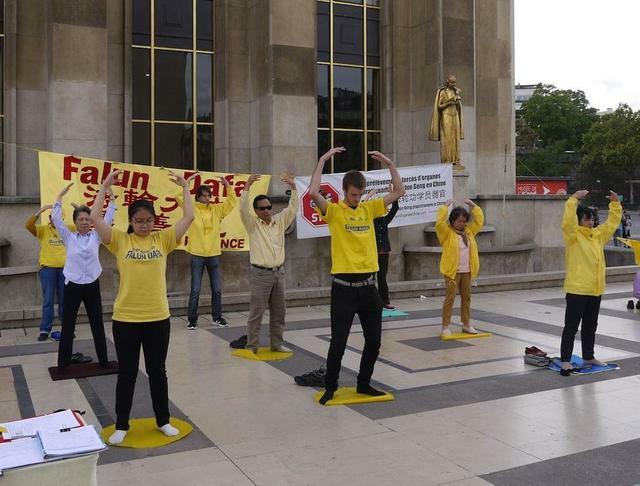 Falun Gong was made public in 1992, and soon spread across China due to its beneficial effect on health improvement and morality. Nearly 100 million people practised it by 1999. Out of jealousy, and paranoid of losing control of the people, Jiang Zemin, former head of the Chinese Communist Party (CCP), initiated the persecution of Falun Gong on July 20, 1999. 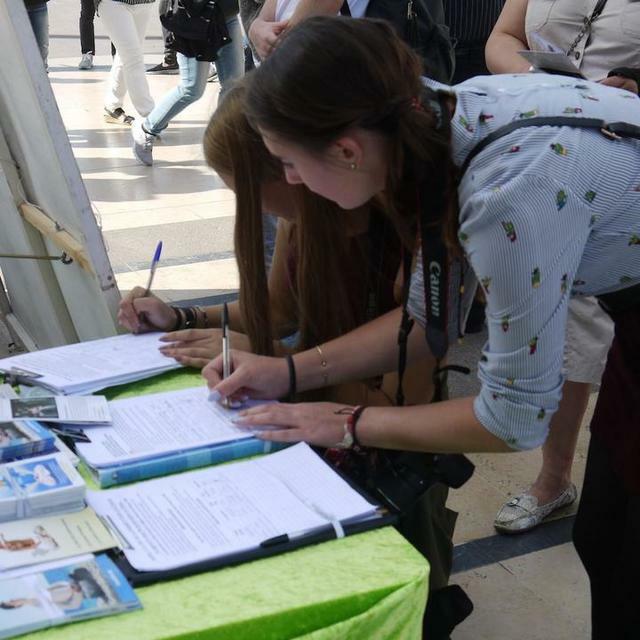 The persecution has led to the deaths of many Falun Gong practitioners in the past 18 years. More have been tortured for their belief and even killed for their organs. Jiang Zemin is directly responsible for the inception and continuation of the brutal persecution. The CCP even conducts state-sanctioned live organ harvesting for profit. Due to the CCP's information censorship, the exact number of practitioners who have died in the persecution is not known.